Bodegas López may have a reputation for mass-production, low prices and average quality, but that’s no excuse to write off a visit if you’re in the area. Although it produces huge quantities of simple budget wine for internal consumption (like the brands Traful and Vasco Viejo), the bodega is really easy to get to from the city of Mendoza and it offers a tour which is both fantastically detailed and also free of charge. If you’re looking to save a few pesos or just to grab a great introduction to the Mendoza wine scene it’s pretty hard to beat. The bodega at the beginning of the 20th century. Image from Bodegas López. The bodega was founded in 1898 by José López Rivas who had been a successful wine and olive oil producer in Málaga, Spain. In 1886 José emigrated to Argentina to escape the devastating effects of the Phylloxera disease which was ravaging European vineyards. The business he founded soon became part of the success story of Maipú. The end of the nineteenth century saw the small town half an hour east of Mendoza city boom. Demand for wine rose as waves of thirsty European immigrants flooded into the rapidly-expanding capital, Buenos Aires. Like Trapiche and Rutini, Bodegas López owes its status as a household name to this period of immense wealth and profit. Unlike many other Maipú winemakers, these businesses were some of the few who managed to survive the crisis which rocked the wine industry in the 20th century. 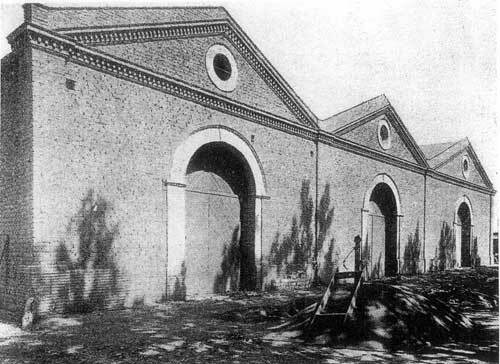 If you visit Maipú, you’ll soon notice that the effects of this collapse are still visible today; the town is strewn with long-abandoned wineries. There’s a particularly forlorn example on the right hand side of the road as you walk from the tram stop to Bodegas López. Unusually for Argentine wineries, Bodegas López is still in the hands of the original López family. José’s grandson, Carlos Alberto López, is the current president and his two sons (Jose’s grandchildren) Carlos and Eduardo are responsible for winemaking and finances (respectively). This winery is one of the easiest to visit if you’re staying in the city of Mendoza. You’ll need to get your grubby little hands on a RedBus card (try asking every kiosco you see, you’ll find one eventually). Make sure you’ve got enough credit on it to travel. In January 2016 the tram journey cost $6 (Arg pesos) each way – remember prices change frequently in Argentina due to the current rampant inflation. Trams leave every 15 mins and there’s a stop just three blocks from Plaza Independencia (Mendoza’s main central plaza) where the streets Avenida Sarmiento and Montevideo meet. Bodegas López is just a 300 metre walk from the last tram stop, Estación Gutierrez. When you get off the tram, make sure you check out the really helpful tourist information centre in the station which will give you a map and point you in the direction of Bodegas López. Extra fun fact: If you look closely you’ll notice the trams are actually red San Diego trolleys! Visits to the bodega are pretty relaxed. This means you won’t need to make a reservation (as long as you turn up a good hour or so before closing) but you may need to wait around a while until your tour starts. If you’ve got a tight schedule calling ahead may be a good idea. We requested a tour in English and had a wait of around half an hour. Given we were getting something for nothing, waiting didn’t really bother us. There’s plenty to see while you’re waiting; you can take a look at the old machinery outside, check out the museum in the basement and browse the wines for sale in the showroom (which was refreshingly air-conditioned on the blistering day we visited). Old wine presses in the outdoor museum. The staff we encountered were all lovely, if a bit busy and somewhat disorganised. We were repeatedly told there was no English tour, until our English-speaking guide turned up. Immediately all our reservations melted away. Our guide was the epitome of charm, possessed a very impressive level of technical knowledge, and spoke 4 languages. I can honestly say that this is one of the best winery tours I’ve ever experienced (and I’ve done quite a few). Those who know very little about winemaking get an excellent overview of the process, while the more knowledgeable are free to dig more deeply. And best of all it costs absolutely nada. The visit includes a tasting of a red and a white from the bodega. The samples are small (what do you expect for nothing?) but satisfying. First up was the López Dulce Natural 2015, a heavily chilled medium-sweet white made from a blend of Torrontés, Viognier and Moscatel. It’s a fairly simple but well balanced wine which would make a great refresher for one of the many hot summer days we experience in Argentina. On the nose there’s a floral whiff of the Torrontés, but on the palate a peachy fruitiness dominates. The second wine was from their much-lauded Montchenot range which had been aged for 10 years in oak cask and in bottle. Rather strangely, the wine presented did not actually seem available to buy anywhere, not even in their showroom. The wine is a Bordeaux-style blend of Cabernet Sauvignon, Merlot and Malbec from old vines planted in the 1940s. Although it had been decanted several hours earlier, something was just not right with this wine. It wasn’t unbalanced or offensive, rather just flat and underwhelming. Maybe it was just going through a closed stage and more bottle time might improve things (I was feeling generous after all their kind hospitality). One Sentence Summary: Definitely worth a visit if you’re cash-strapped or new to Mendoza, and be sure to enjoy the well-chilled glass of white! Those old wine presses are incredible! And also huge! You don’t get a sense of the scale from the picture. Thanks so much! I’m glad you enjoyed reading it.